This was an exciting painting to do. 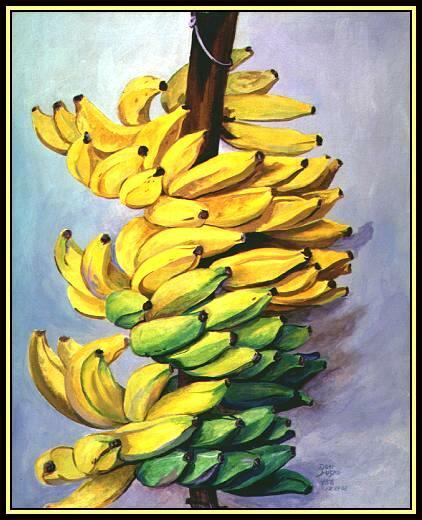 The bananas were turning yellow very fast, starting at the top. In the three days it took to draw and paint this bunch they changed from all green to all yellow. Paintings can be photographed indoors using 3200 Kelvin lamps placed at forty-five degree angles to the canvas surface to reduce glare. Also, 90 degree canvas rotation may help reduce glare as well as the use of polarization filters at the light source and at the lens. A possible negative effect of polarization is an artificial increase in contrast. I photograph my painting between 10 and 11 in the morning. I have found this to be the whitest light. Lay the painting on the ground and shoot from directly above. Watch for shadows and insects! !